The Texas Junior Livestock Association is committed to providing access to services and information online in a manner that respects and protects your privacy. This statement describes our information, collection practices, and explains how we use and protect your personal information We subscribe to important privacy protections found in the American Library Association’s Code of Ethics. This statement applies only to information collected by this web site. It does not apply to, such as information collected offline; surveys or research studies conducted by other means. Your login information. Login information is used to determine whether or not you are authorized to use specific services. As applicable login information / passwords are not stored. This information is used to process your application, your registration, your purchase, your gift; respond to your requests, communicate with you, provide you with better service; as agreed upon. We may combine this information with information from previous visits to provide you with added convenience in using our products and services. The information entered on this site, including for example your name, contact information and credit card information, is collected to process the transaction you are authorizing. We utilize third parties to process this transaction, using only the necessary information needed to securely perform their functions, and they are prohibited from using it for other purposes. Tracking information that you specifically agree to. With your opt-in consent, we collect personally identifiable information that allows us to track your visits online and offer you information we believe would interest you, based on your visits to our web site. Auto-collected information (web logs). Our web server automatically recognizes the Internet domain and IP address from which you accessed our web site, the date and time of your visit, and the pages you visited on our site, as well as information automatically forwarded by your browser. This information is used to help us understand aggregate uses of our site, track usage trends, and improve our services. Web logs may also be used for system problem monitoring and maintenance. This information is retained for one year and then deleted completely from our systems. Cookies are small text files that many web sites transfer to users’ hard drives to enable the site to deliver personalized services or to provide persistent authentication. The information contained in a cookie typically includes information collected automatically by the web server and/or information provided voluntarily by the user. The user controls, via the computer’s operating system, whether cookies will be accepted and, if so, how they will be handled by www.tjla.org. Our office is committed to ensuring the security of your information. We have put in place reasonable physical, technical, and administrative safeguards designed to prevent unauthorized access to, or use of, the information collected online. That you permit OR in accordance with your consent. This site may contain links to other web sites not affiliated with our office. We are not responsible for the privacy practices of these other sites, including other Texas Junior Livestock Association sites. We encourage you to read the privacy statements of other sites for assurance that their practices safeguard your privacy. Does not use cookie technology. Uses cookie technology. If the user blocks cookies, however, this will not affect the functionality of this site. If the user blocks cookies, this will negatively affect the functionality of this site. For example, the Texas Junior Livestock Association has contracted with third parties that have met industry-standards for security to take in necessary data, such as credit card information, to store, transmit, and process this transaction securely. 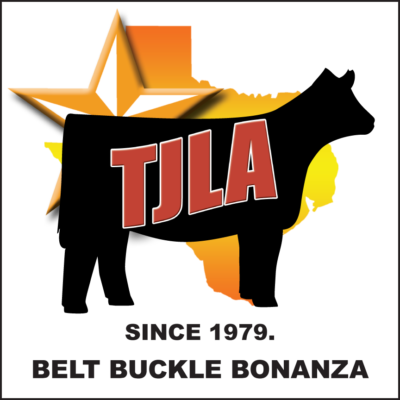 The Texas Junior Livestock Association has contracted with third parties that have met industry-standards for security to take in necessary data, such as credit card information, to store, transmit, and process this transaction securely. If you are authorizing periodic payments, these third parties will retain the information you have provided when necessary to process such payments. This web site is intended for use by people aged 13 or older. If you are under 13, please do not send any information about yourself to us, including your name, address, telephone number, or email address. In the event that we learn that we have collected personal information from a child under age 13 without verification of parental consent, we will delete that information as quickly as possible. If you believe that we might have any information from or about a child under 13, please contact us. We reserve the right to modify this privacy statement at any time and will post the changes on www.tjlaonline.com. As described in the processing of your transaction, by clicking Submit, you agree to the transaction under the terms entered above and under the terms of this Privacy Statement. This Policy was last updated on February 14, 2017.